The match Schalke 04-Freiburg 1. Bundesliga will start today 14:30. Referee in the match will be Frank Willenborg. Team Schalke 04 is located in the middle of the table. (14 place). In 5 last matches (league + cup) team gain 7 points. From 3 matches can't win a match. The best players Schalke 04 in 1. Bundesliga, who scored the most goals for the club: Daniel Caligiuri 4 goals, Steven Skrzybski 3 goals, Nabil Bentaleb 3 goals. Players with the most assists: Daniel Caligiuri 2 assists, Steven Skrzybski 1 assists. Injured players Schalke 04: Steven Skrzybski, Alessandro Schoepf, Breel Embolo. Daniel Caligiuri, Alexander Nuebel. They will not be able to play in the game due to suspension. Team Freiburg is located in the middle of the table. (13 place). Last 5 games (league + cup) finished balance 5 points. Freiburg from 4 matches can not beat any rival. From 2 matches no lost a match. Players Freiburg in 1. Bundesliga with the highest number of goals: Gian-Luca Waldschmidt 6 goals, Nils Petersen 5 goals, Florian Niederlechner 3 goals. Players Gian-Luca Waldschmidt 1 assists, Nils Petersen 2 assists, Florian Niederlechner 1 assists will have to be very well guarded by defenders Schalke 04, because they have the most assists. Injuries in the team Freiburg: Manuel Gulde, Brandon Borrello, Roland Sallai, Robin Koch, Nicolas Hoefler, Tim Kleindienst, Florian Kath. Direct matches: usually ended with winning of Schalke 04. 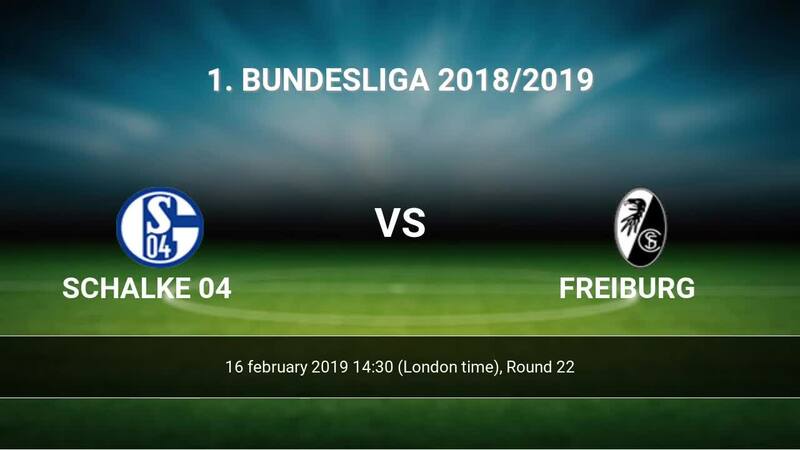 Balace of both teams games are: 12 won Schalke 04, 11 wins Freiburg, 6 draws. In 14 matches the sum of the goals both teams was greater than 2.5 (Over 2.5). On the other hand, 22 matches teams scored more than 1.5 goals (Over 1.5). In 14 matches the both teams have shot at least one goal.